Crest Events can plan and manage the perfect business lunch or boardroom lunch which will impress even the hardest to please clients. You can choose between a range of services from the full 2 or 3 course meal, light lunch, finger food to fancy sandwiches. All our food is seasonal, fresh and always on time. 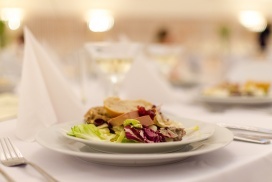 The light business lunch is one of our client’s favourites, get in touch to discuss how Crest Events can help. For something a little bit extra we offer a personalised dining service where we create a bespoke menu suitable for you and your clients taste and style. Have a theme in mind? 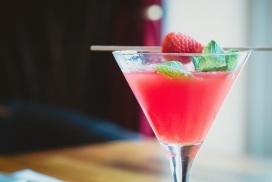 Impress your sponsors by having the drinks or food styled to their brand. Have a look at our corporate lunch menu for ideas or contact us to discuss your needs. Boardroom catering isn’t just what we do. We can organise a range of other fun activities which is a great way to reward your employees or entertain clients in the boardroom. Some examples of activities we have done in the past include: cocktail making classes, caricature artists drawing employees, beer and wine tasting and yes even magicians. Corporate entertainment doesn’t have to be boring… your clients, employees and business partners will always be excited if they know Crest Events is organising it. At Crest Events we know the stresses and strains of running a business, by using our services we make sure all our events are well organised and managed saving your business time and money. All our invoices are broken down showing exactly the costs involved giving you peace of mind. We have spent years finding and vetting suppliers which means better value for your business. Leave the stress of organising your corporate events to our experienced event managers .